La Voz de Tres blends infectious rhythms and nuanced songwriting traditions from Latin America, original compositions, and works from the great American songbook, creating a delightful and surprising improvisational texture. 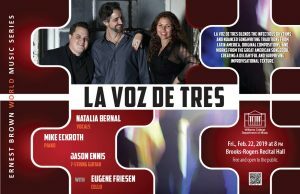 For this concert the trio of vocalist Natalia Bernal, pianist Mike Eckroth, and seven-string guitarist Jason Ennis are joined by another longtime friend, composer, improviser, and multi-genre cellist, Eugene Friesen. 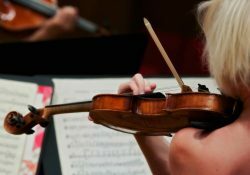 Natalia Bernal is a singer whose entrancing voice evokes the dramatic landscape of her Chilean homeland. 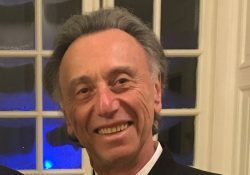 Mike Eckroth is known as a formidable pianist who possess an unwavering groove and intimate familiarity with jazz and Cuban music idioms. 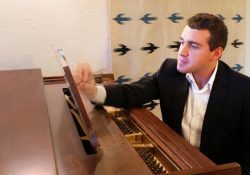 Guitarist Jason Ennis slides fluidly between classical and blues-based phrasing on an instrument borrowed from the Choro traditions of Brazil. 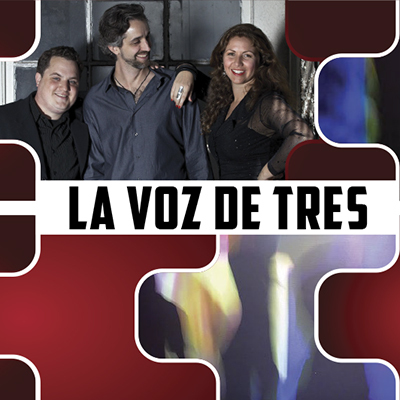 These three voices comprise the unique sound of New York City-based world jazz trio, La Voz de Tres.